NSW Government: The home of Sydney’s new light rail fleet and nerve centre for the CBD and South East Light Rail operations has been unveiled ahead of the arrival of more trams. 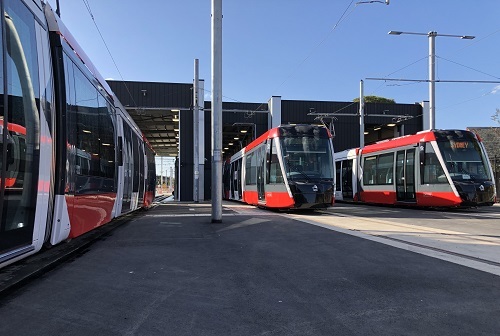 Minister for Transport and Infrastructure Andrew Constance said energisation of the Randwick Stabling Yard was a crucial phase of the project, signaling that day testing of the trams will commence in the coming months. “I’m really excited to see the CBD and South East Light Rail Project coming together,” Mr Constance said. The Randwick Stabling Yard includes the operations room for the CBD and South East Light Rail network, sheds for light maintenance and the fleet wash bay. Mr Constance said the CBD and South East Light Rail recently turned a corner, with ALTRAC announcing final barrier removal will start in the coming months, taking the project one-step closer to the start of operations for the community and businesses. “As the civil construction winds up along the alignment, we expect ALTRAC to ensure the barriers will either have a much smaller footprint, or be removed completely,” Mr Constance said. Based on ALTRAC advice, barriers will be removed or reduced in the City North, Surry Hills and Moore Park by November, followed by zones in the City South by January 2019 and Randwick and Kensington/Kingsford in February 2019.